Yeah yeah, I know, we just covered pork roasts not that long ago. This is me not caring. This is you grinning from ear to ear after your first bite. Trust. Rest the pork for one hour at room temperature before cooking. 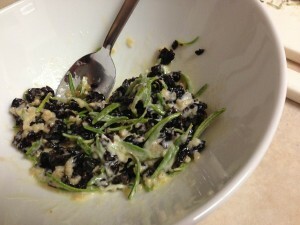 Mix the garlic, cherries, rosemary, vinegar, and mayonnaise in a small bowl. Pat dry with paper towels and season the pork with generous sprinkles of salt and fresh cracked pepper, being careful not to over-salt. Heat the oven to 350 degrees. Heat a cast iron skillet over medium-high heat and add enough canola oil to barely coat the bottom of the pan. Sear pork until browned on all sides. 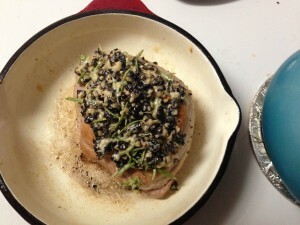 Coat the top of the pork roast with the cherry/rosemary mix, spreading evenly. 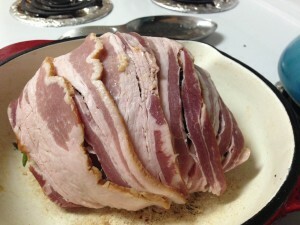 Lay the bacon across the roast, tucking the ends of the bacon slices underneath the roast. 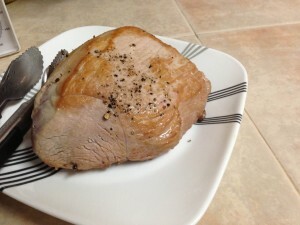 Roast for 45-55 minutes. Start taking peeks around 40 minutes. The bacon will brown but shouldn’t be burned. Let rest 10 minutes before carving and serving. 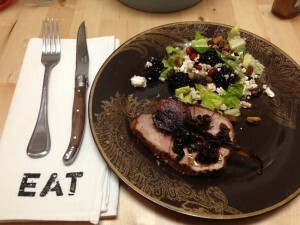 bacon, Bacon-Wrapped Cherry Pork Roast, cherries, garlic, leah charney, pork, rosemary, Valentine's Day. Bookmark the permalink. Post a comment or leave a trackback: Trackback URL.